Charts the author’s journey of healing from the trauma caused by having to go into hiding as a child and deny that she was Jewish. It is not intended as an autobiography or a clinical paper on the healing process but as an account of a very personal inner journey. Describes an inner journey with honesty and insight, using a fruitful blend of description, dream, artwork and poetry. For me the poetry stands out as something to return to. As the events of the Holocaust become more distant it is all the more important that books like Marika’s are read. Not that there are other books like Marika’s: this is unique and special. Very unique, thoughtful and moving book using imagery and personal experience to express a personal journey. Very unique, thoughtful and moving book using imagery and personal experience, taking you through a personal journey. I was very moved by Marika’s story and felt privileged to read about her life as a hidden child during a horrendous period in our history. The book is beautifully illustrated with Marika’s own drawings. I think it’s imperative that these individual stories are imparted so that future generations can have a better understanding of what happened by reading the words of those who survived. Beautiful book about a little Jewish girl and her journey from hiding in Budapest, escaping extermination, and later fleeing from Communist oppression. Along the way she expresses her experiences in colourful drawings and images. Redemption finally comes in the spiritual peace of her ancestors. A moving book. Creatively crafted. Deeply personal, yet universal and timeless. A unique and moving book about Marika’s journey of self-discovery to reconcile the trauma of being a hidden child. 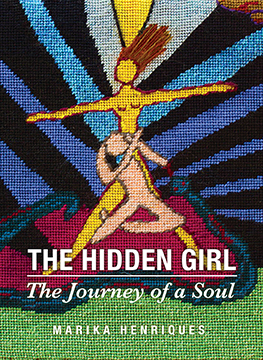 Wonderful tapestries, drawings, poetry and her unique story share the pain of being a hidden girl. After much suffering and courage this leads to joy of her soul’s journey, to feel her way back to her Tradition and sense of belonging. Powerful moving account of her experience, trauma and courage. As the long shadow of the Shoah continues to make sitself felt, this book reveals how almost unimaginable pain can be transformed into previously unimaginable creativity. How an innocent Jewish girl came to victorious triumph over the evil Nazis. A powerful example of the psyche’s self-healing. A poignant and beautifully written account that offers insight from the inimitable perspective of the author. Highly recommended reading! An exceptionally original way of communicating what was clearly an unbearable experience through the medium of both words and pictures used with subtle symbolic effect..
A unique, moving and beautiful book vividly illustrating a journey from trauma to healing. This book is an inspiration in so many dimensions: in the courage to share such a personal journey, in the way that art helps heal, and in the energy and dedication that it took to complete and see it published. This strikes me as a remarkable life-story, not only because of its accurate, eloquently descriptive first-hand account of an unforgettably tragic era, but also on account of the parallel memories of the author’s life and calling in other respects, notably in the arts and philosophical / consultancy realms. The illustrations are very successful in assisting the deep imprint of the textual references on one’s mind, and the direct and personal vein of expression and narrative set it apart from the run-of-the-mill works harking back on life’s numerous and respective disastrous moments, hours and years. It’s so heartening to note the ‘optimistic’ tones breaking through an era of history which most writers bury in sorrow – understandably so, but the ‘net negative’ impacts of diatribes without uplifts can leave dire and dismal impressions…….Marika leaves us – certainly me! – with the belief ingrained to the effect that optimism and determination can heal horrors, and provide a robust roadway for the future. A fantastic cross-section of history, told in a fantastic manner by a fantastically dedicated personality – thank you very much for a most impressive read. A book that is so relevant now that Europe is going through another challenging phase. Essential read, especially for the young. Really enjoyed reading The Hidden Girl and found the artwork really enlightening. Thank you for sharing with the world your experiences. Marika, with patience and courage, stitch by stitch, has drawn out the darkness and horror of her childhood and brought it into the healing light. I would recommend this book to those who have had a traumatic experience as an inspiring example of a way to recover and heal themselves. A wonderful book showing how healing is both a personal experience and a collective adventure. A very interesting and unique read about one person’s journey through trauma to inner peace. Every word, every stitch, woven in time to mark, to heal, to remember . Beautifully crafted. An astonishing achievement, to craft such beauty and meaning from such agonising experience. A challenge and an inspiration to the rest of us, whatever we struggle with in our lives. Every story of witness about Shoah is important because the human memory is so weak. The Hidden Girl is a testimony of great value because it shows that the wounds of the past are still present and need to be healed. The book helps to contemplate this personal pain and in general calls against repeating of any kind of injustice towards Jewish (and other marginal or vulnerable) people, simply towards humanity. Morover, the book as an object is beautiful piece of art, a real gem which can be useful and helpful for other people. Wow. What a journey in so many respects. A very personal and deep process beautifully written and presented on such a traumatic subject. A privilege to have read it. a compelling and profound read. the combination of illustrations and deeply personal narrative is is unique, interesting and engrossing. An unusual book about the subject of the Holocaust from the prospective of a surviver who was young at the time. The author, Marika, not only telling us her story in prose but with her drawings and poems. A unique book of this genre. Today, as tens of thousands of people flee persecution, with an uncertain welcome awaiting them, Marika Henriques’s moving testament of the heart is essential reading. The Hidden Girl is a deeply personal and moving story of a lifetime’s journey of courage and perseverance and a remarkable testament to the healing power of the imagination. Poignant, immediate and immersive, yet offering great humanity, hope and light. This is a unique testimony that I am truly glad to have read and recommend others to do the same. This very unusual and haunting memoir of a childhood lived through the Nazi occupation of Hungary and its lasting aftermath and eventual resolution ranks with the best of holocaust literature: authentic, moving, and in its account of a life beyond, different to those which recount only the history. Engaging in Marika Henriques beautiful book is a deeply moving experience that inspires me with hope. Marika Henriques’ book is not only vitally important evidence of that terrible time, but its story of the journey from such terrors by means of potent creative release is nothing less than life-enhancing. A touching and remarkable book based on true life. I was very moved to read it and found the illustrations memorable. An inspiring book for our times; it needs to be read. Marika is to be thanked for this gift of her story. An very emotional read that portrays both pain and the power of the human spirit to overcome horrors. This is an important book, describing a woman’ s childhood during the holocaust. The complexity of her journey to reclaim and embody the past is stitched in color and feeling . This immense work is described in simple yet profoundly moving images. To be read again and again and shared as an inspiring story of courage , resiliency and soul making. Marika leads us on a very personal journey of pain and healing. Marika reminds us that suffering is universal, yet our response and choice afterwards is not. Marika’s journey is fascinating, as she describes the years after her trauma as a hidden child in the Holocaust and the work she had to do to free herself from those very difficult experiences. An interesting personal memoir extremely well written. An extraordinary work from a truly extraordinary woman. Highly recommended. A very moving and unique account from a wonderfully warm writer. I was in Budapest this autumn, staying in the Jewish quarter and every day passing the memorial wall: Marika Henriques’ personal story came back to me each time and spoke to me about those times and their terrible sadness, and the work that Marika did to heal her past. Please read this important book. It’s a brilliant book and well written. Higly recommend it! I really enjoyed reading this book. While I was reading it, it felt like I am involved. I recommend this book to everyone. This is a beautiful book – both emotionally and visually – that expresses the power of healing through creativity and the brave exploration of the deepest parts of ourselves. A unique account that is brimming with the author’s humanity. This book truly makes you think about your life, and others. The world today could learn a lot of very precious life lessons from Marika. I have read the book several times and each time I learn something else more valuable than before. A story of great courage from a very impressive lady. A very good read. Now more than ever these stories are so important. Marika tells her story in a way that only years of reflection can produce. The illustrations, her capturing of the moments so personall all contribute to making this a beatiful book. I’m so glad she wrote it . A most moving, personal account of the process of healing following traumatic experiences during the Holocaust. Together with evocative drawings and tapestries, Marika has given us a remarkable insight into her inner journey from darkness to light. To be treasured. The autobiographical narrative in this book is both harrowing and joyful. Inevitably harrowing, as it recounts the traumas of a Jewish child hidden and lost amongst the terrors of Nazi occupied Hungary. Joyful, as it affirms the life spirit that maintained the author throughout the dark aftermath of such experience and which insisted that such terrible events would not destroy the soul, but become the material for her life journey, accomplished using her dreams and her art, and with the benefit of the theories of C. G Jung. A moving book, relating a life changing experience. This is a very powerful, moving book and a wonderful addition to the Holocaust genre. This is a unique and wonderful contribution to the genre of Holocaust writing. The textual addition of embroidery and painting make it a very special piece of work. The anguish of separation borne by a child in silence and carried into adulthood finds its outlet towards healing in raw imagery, simple stitching and exquisite poetry. A courageous work. A truly powerful and very moving account of a childhood trauma at the time of the holocaust. No longer hidden, it must connect with the story of so many innocent Jewish children during those terrible years and after. The recovery, so evident when you meet this lovely person, demonstrates the strength of the human spirit. A deeply moving, beautiful book. Reading it is life-enhancing. this book warms the soul and gives insight into the power of the symbolic life to access healing through images. It is a unique book and unique story. The combination of very powerful embroidery, poems, Marika’s thoughts and experiences is just incredible. I have read it a few times and each time I am finding it more powerful. It is an important book and important message for the future generations. Poems, paintings and tapestry fuse to explore Marika’s story of trauma and healing. Moving, memorable and hugely inspiring. Beautiful, unique and very moving account of the resilience of the human spirit and one woman’s journey of reflection, self-realisation and healing. Truly inspiring. The Hidden Child is a life story of depth and power. Its personal utterances and images become universal, uniquely unfolding and interweaving threads of memory, dream, history and vision. It is The Journey of a Soul that takes us beyond words and images. A rare, extraordinary and important book. A heartfelt story, which I thoroughly enjoyed reading. As relevant today as it was at the then. I could not resist to read this book immediately once I got it in to my hand. It is very unique, emotional and inspiring. This book provides insight into Marika’s profound journey of discovery and gives a universal message of hope and resilience that all can benefit from. Unusual, interesting book about a way of healing horrors of childhood as an adult. salute her for her achievement. A unique inner journey of healing and courage. Marika Henriques book is an outstandig publication of her hidden Life and the Pictures are Beautiful. This wonderful book touched me at a very deep level enabling me to see how the Self heals in so many unforeseen ways. Marika has an amazing gift for describing, not only the trauma she experienced both as a hidden Jewish child and again as a young woman escaping across the border from a communist country, but she so eloquently and soulfully outlines, through the use of art, embroidery and poetry, the inner work that allowed her to heal. This is a book to read and return to whenever inspiration and courage are needed. A moving tale of courage and the triumph of the human sprit, told with stunning honesty and transparency. The book is lavishly illustrated with photos of tapestries created by the author during her years of coming to terms with the traumas of a Jewish childhood in Nazi-occupied Hungary during the Second World War. Replete with wisdom and acceptance, The Hidden Girl will inspire all seeking to overcome the challenges inherent in each of our lives. A wonderful and important book sharing a story that needs to be told. This is a very personal story of a journey of healing with a universal message of hope. It is beautifully illustrated with Marika’s tapestries and drawings. Marika’s unique account of her personal experience of the Holocaust is told in a multi-dimensional book. She recounts her dreadful experiences as a child using poems and illustrations to deepen the reader’s understanding of an appalling episode of recent history. The attractiveness of this colourful book reflects Marika’s ultimate optimism despite everything she and millions of others had to live and die through. I am the author of this book. I hope that the “Hidden Girl” will speak to the soul of others and help heal the trauma they suffered in their lives. This beautiful book is a wonderful insight into such an incredible woman’s life and experience. Bringing together her unique prose, art, and poetry, in a timeless story, and powerful expression, of a path through early trauma, to new meaning, and healing. Marika’s braveness in sharing with us her outer and inner journey touched me in such a deep level, that made me find courage and strength to make changes in my life in keep pursuing my inner truth. Her book is not just about the events that happened in her life, but mainly about how she healed her soul, giving meaning to all her emotions, acknologying, recognising and changing them in the such a deep level that not many of us has the guts to do so. I’m extremely grateful, because she has helped me and touched my soul with her brilliant work. The joy of reading this book is to acknowledge that the painstaking and enduring task of life is to be happy, despite everything. To do this we must integrate ALL of who we are, both hidden and revealed. The search for wholeness sometimes comes at a the deepest price. As this book unfolds we see the path of Marika is the ultimate expression of a spirit freed. It is so true that the people we often admire the most have very often suffered the most. Even then there is always more pain because ‘ you have been deepened so that you may take the strain’. This beautiful book is a legacy that will no doubt inspire others to go deeply, unafraid of the journey, step by small step through examination of their own hidden memories and perhaps artistically create their own ‘cloth of gold’. I cannot wait to see the tapestries whose every traumatic stitch has called to the hidden child and healed the soul of an old lady. Powerful, poignant and thought-provoking, a much-recommended read. Dear Marika! Thank you for taking the courage of putting your soul’s journey down to paper also for publishing it. I feel honoured by being allowed into this intimate piece ( … of work, … of art, though you say you never intended it to be art…). I congratulate you and again I want to express my thanks for the privilege of holding this book in my hands and partaking in your journey. Uplifting to read of this journey , beautifully encapsulated in the title . There are so many autobiographies and historical accounts of the Holocaust era, as well as films and TV series. It is challenging and exciting to seek and find any which stand out and tell one more – and more passionately – than any others about that dramatic time. Marika’s way of remembering and writing about what happened, what she encountered, what she thought and what happened to her then as well as since then is remarkable. The first-hand impacts and reactions are strong at the same time as sensitive. Tracing the events through to the effects left on her soul and her thinking in later life are very unusual and bring the memories to life again despite time passing. As one who understands art and has a natural leaning towards psychology and to ‘alternative ways of thinking and feeling’, she generates qualities and levels of understanding and compassion which are very unusual and enter one’s heart, mind and memory in a very vivid way. I was so impressed by every bit of this unique way of recounting the detail of this darkest era and what can follow it. Unusually beautiful description of turmoil and salvation of the soul of a survivor. This book is an important testimony to the brutality capable by human beings. However it is also a witness to the humanity and courage of many who stood up during the dark times of he world history.Marika Henriques has captured through her experiences the deepest parts of human nature and behaviour, but most of all how she was able to rise above all sadness, to survive, live and highlight the need for humanness, kindness and care. The writing, the paintings and needle work have beautifully been combined to leave a long lasting impression on the readers. The book is a masterpiece, loved it even more the second time around! This is a book I love to return to as the drawings, tapestries and poems have depth and meaning that invite more exploration. It took great courage firstly to over come the traumas of her life and then write about it. I have great admiration for the writer. This book is extremely recipes to me because it talks about every hidden inner child who has suffered losses and pain. The way Marika bravely faced herself shows that it’s possible for everyone to heal their souls and become whole. Thank you Marika for such a stunning and amazing gift you’ve given us. had the stamina and courage to publish it. A breathtaking account of one women’s journey. The drawings are a moving way of a coming to terms with childhood trauma. Very well done. A very touching account of the author’s journey through a most horrific time. Her message is very relevant now. Having read so many testimonies on this subject, I loved the way this story is told, with the simplicity and directness the writer has engaged. This has meaning at all levels and for all ages, from the straightforward drawings and embroideries relating to what are painful memories that need to be retold to appreciate why they need to be relived, through to deeper analysis of their historic relevance which, in turn, allows the sufferer to move on. I loved the book and recommend to everyone that they read it. A beautifully heartfelt book that leads one to look into the inner world and inspiring process of the author. A path from suffering, to a road that illuminates healing, love, kindness and hope. this book shows how the wounded soul can recover from profound trauma if its messages are paid attention to; in that sense it is a remarkable testament of hope.